Our mission at the Montreal Academy of Music Scholarship Program is to provide scholarships to deserving music students across Montreal. Whether as a result of exceptional talent, or exceptional circumstances, we offer scholarships to many young students who otherwise would not have access to music education. We believe that all children deserve an opportunity to study music. 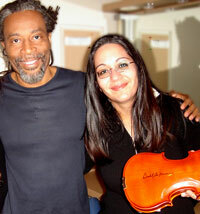 We are proud to have received the support of artists such as Mr. Bobby McFerrin..
Bobby McFerrin is a ten-time Grammy Award winner, one of the world's best-known vocal innovators and improvisers, a world-renowned classical conductor, the creator of "Don't Worry Be Happy", an ambassador of both the classical and jazz worlds and a passionate spokesman for music education. Thank you Bobby! 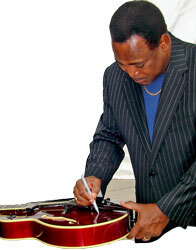 Several artists, including George Benson, will be helping our fund raising initiativesby signing musical instruments to raise funds for our program. Contact us for details on how to purchase one of our specially signed instruments in support of the scholarship program. Last year we awarded 3 scholarships to deserving students and hope to offer a growing number of scholarships per year. Donate an Instrument: Do you have an instrument at home that you are not using? Please contact us and we would be happy to pick it up. Your gift will make a difference. Sponsor an Event: If you would like to sponsor one of our upcoming events, please contact us. We would be happy to have you on board!